OTTAWA, Ontario, November 9, 2017 – The Ontario Government today announced that Bluink Ltd. will develop eID-Me, a secure digital identity carried on user smartphones, as part of Ontario’s Small Business Innovation Challenge (SBIC) in response to the Digital Identity Program problem statement issued by the Ministry of Government and Consumer Services. The SBIC program is being delivered by Ontario Centres of Excellence on behalf of the Government of Ontario. Launched in March, SBIC is an integral part of Ontario’s Business Growth Initiative and Ontario’s new economic strategy. Under this exciting new partnership, OCE and the Government of Ontario are helping SMEs launch their innovations from the idea stage to become globally competitive products and services. The SBIC program uses public sector challenges as a platform for inspiring SMEs to develop and test innovative technology solutions. eID-Me allows Ontarians to prove their identity for online and face-to-face services with convenience, strong privacy, and no passwords. eID-Me’s strong security and simple user experience will help reduce human error, fraud, and identity theft while saving time and money for Ontarians and the Ontario Government. Today, people expect to do more online, from anywhere. Smartphone penetration in Canada is estimated to reach 68% in 2018, according to Statista. People are migrating many everyday activities and transactions to mobile, and the Government is serving them by offering different service options, including digital. Bluink’s eID-Me provides a convenient mobile user experience. 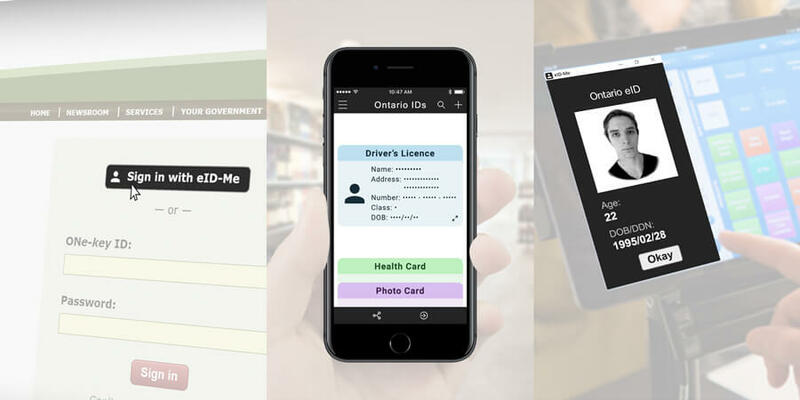 Ontarians who have existing Ontario identity records, such as health card, driver’s license, or age of majority, will be able to register for eID-Me directly from their smartphones. Remote registration and authorization via smartphone can eliminate the need to travel to ServiceOntario centres for applications, and reduces time spent manually inputting, verifying, and updating identity information at medical clinics and other organizations. Online, eID-Me enables strong identity proofing and password-free logins to web services (both government and third party). eID-Me can also be used offline in face-to-face scenarios as an alternative to an Ontario Driver's Licence or Ontario health card, for fast check-ins at medical clinics and hospitals or age-of-majority checks at bars and LCBO. Users easily authorize these identity checks by tapping on their smartphone or using their smartphone’s biometric scanner. No physical ID cards are required. Convenience must be balanced with security and privacy. eID-Me leverages every available security mechanism on smartphones to ensure identities cannot be stolen, copied, or forged. Identity information is secured on the user’s smartphone with strong encryption. eID-Me’s public key cryptography resists popular forms of identity theft and fraud such as phishing, replay, man-in-the-middle, and man-in-the-browser attacks. Identity claims cannot be tampered with, without invalidating the digital signature. In addition, next-generation hardware security modules (HSM) ensure that eID-Me registration and identity services run in a trusted execution environment and cannot be attacked. Securing identities on users’ smartphones eliminates the need for centralized identity stores and password databases; thereby preventing the trend of large-scale identity theft. In every transaction, the user always sees who is asking for their identity information and can choose specific pieces of information they want to reveal. For example, when purchasing alcohol, users can reveal their age and photo while keeping their address and driver’s licence number hidden. Users have full control over their personal identity, with unprecedented convenience and security. Over the coming year, Bluink will develop eID-Me with the Ontario Government in partnership with Crypto4A, Canadian POS, and Carleton University. eID-Me will be ready for pilot deployments in fall 2018. Learn more about eID-Me at eid-me.com. Bluink Ltd. is a cybersecurity company headquartered in Ottawa that develops smartphone-based identity and access management solutions, including secure password management, two-factor authentication (2FA), single sign-on (SSO), federated identity, and phone as a smart card technology. Visit bluink.ca to learn more.